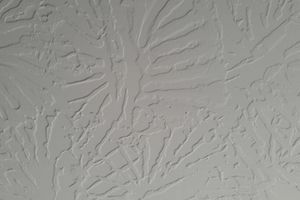 Slap brush texture, also known as crows foot, stomp brush, or stipple, is easy to make on drywall surfaces using basic drywall compound, or "mud." The resulting texture has a fan-like or sunburst effect created by the fanned-out bristles of the texture brush. The technique is straightforward, and you can achieve different textures by overlapping the stomp pattern more or less, altering the thickness of the mud, or using a different brush that makes a unique imprint. The stiffness of the bristles usually determines the depth of the ridges in the joint compound. The easiest type of drywall mud to use is premixed, all-purpose, lightweight drywall compound sold in buckets. Pick up an extra 5-gallon bucket for mixing the compound with a little water to thin it. If desired, you can speed up the mixing by using a power drill and a small mixing paddle, or you can simply mix the mud by hand. You'll also need a paint roller with a 1/2-inch-nap roller cover and an extension pole. Finally, choose a texture brush that will give you the desired texture pattern. There are many variations, including double-brushes, small or large brushes, round and irregular brushes, and so on. Stomp textures approximate the look of hand-applied plaster textures commonly used on ceilings in older houses. This offers a refreshing change from the standard spray-on textures, like the orange peel or knockdown effects used in modern drywalled homes. However, it's easy to go too far with a stomp texture and apply too much mud, thereby creating a really heavy, deep texture. In extreme cases, the texture can have dripping peaks that look like stalactites when dry. You don't want a stalactite ceiling. Keep the mud relatively thin and apply it in a smooth, even layer for best results. Another point to consider is that drywall textures take practice. The textures you love in old houses were made by skilled craftspeople who worked with plaster every day. So don't assume you can get great results the first time you pick up a stomp brush. Spend a little time practicing the technique on a scrap piece of drywall or even cardboard or plywood. You can practice over and over by scraping off the textured mud before it dries. A slap brush texture can be applied over new bare drywall or painted drywall or plaster, but painted surfaces should be cleaned thoroughly to remove all dirt, dust, and oils. If the paint is glossy, consider sanding it to scuff up the surface or washing it with trisodium phosphate (TSP) to lightly etch the paint so the drywall mud sticks. Add some drywall compound to an empty bucket, then add a small amount of water and mix thoroughly to achieve the consistency of a thick but rollable paste. Prepare a paint roller with an extension pole. If desired, you can also use an extension pole on the slap brush. Dip the roller into the thinned compound, coating the roller completely. Let excess mud drip off. Roll the mud onto the surface in a thin, even layer. Roll in one direction, then come back roll in a perpendicular direction to even out the layer. Cover a workable section, such as 4 by 4 feet. Stamp the mudded surface with the slap brush, working from one side of the area to the other. It's usually best to stamp only once into fresh mud, but you can overlap the pattern as desired. Repeat the same process to complete the surface texture. Do not let the textured mud dry before rolling out the next area. Fresh mud will stick to dried mud, but it's difficult to get the textures to blend between dried and fresh sections. Let the surface dry at least 24 hours before priming and painting. How Does Built-Up Roofing Compare to Other Roofing Materials? What Type of Underlayment Should I Use When Installing Shingles? Is Insulated Vinyl Siding Worth the Extra Cost?